There was no way I was going to miss this afternoon's Press Conference with Our General Manager Jim Bowden and Our Manager Manny Acta discussing the Big Trade of My Main Man!! Ryan Church and Our Catcher Brian Schneider to The New York Mets for Lastings Milledge. Had to hear the words from those that conducted the swap. The surprise addition of Milledge himself on the conference call--made the entire effort worthwhile. No, I don't know much about Lastings--but in his brief question and answer period with the press, he was impressive--especially for someone of such relative youth--22 years old. As usual, I recorded the event in its entirety on my Ipod. Below is my transcript of the entire Press Conference with Jim Bowden, Manny Acta and Lastings Milledge on Friday Afternoon, November 30th, 2007 at 3:30PM. All 18 minutes worth. Question: Milledge had a lot of controversy in New York, some of which seemed sort of petty. Manny do you think it was overblown and how do you feel about his character? Question: How do you feel this trade will affect your team on the field? And, who do you think will replace Brian Schneider in that leadership role? Question: Will that change your approach in Free Agency? Question: What are you feelings that Milledge can play center? You have Pena, Kearns and Milledge now—how do you see them lining up in the outfield? Question: Is Jesus Flores your starting catcher or do you feel you need to acquire a starting catcher? Question: You have seen Lastings develop over the past few years—from afar. What do you think is the next step in his development? And, where do you see him hitting in the lineup? Question: As to where he will hit in the lineup? Question: Manny, out of curiosity—once Lastings Milledge hits his first home run as a National—and he goes down the right field line and high fives all the fans—what would be your reaction? Lastings Milledge joins the telephone conference. Question: How shocking is it to be reunited with Manny Acta? What did you think of your time in New York? What did you think of all that quote, unquote, and controversy? Would you talk about that? Question: You’ve had the opportunity to play all the outfield positions in the Major Leagues, how do you rate yourself as a centerfielder—as compared to playing left and right? Question: Did not playing everyday affect your performance in New York, will playing everyday help your development? Question: Over the past few years, you have been involved in a lot of trade rumors. How do you feel now to be more certain about your situation? Do you feel comfortable that you may have found a home in Washington where you will get more playing time? Last Question: This is a high profile trade and a lot of people will pay attention to it for the names involved. There will be some amount of pressure on you. Are you ready for that, can you drive yourself off that—at all? Lastings Milledge: “I will go back to the other question about being in New York and handling all the controversy and everything like that. Having the pressure of being a Number One Draft Pick for a Big Market Club—and having to come in and expect all the fans to expect you to carry the team. I feel like I don’t have any pressure to show anybody anything because everyone knows what I can do. The biggest thing is that The Front Office and Jim (Bowden) and Manny (Acta) know what I can do. So, I don’t feel like I have to prove anything to anybody—except these guys." The most interesting comment for me was Our General Manager stating that he was not 100% sure that Jesus Flores would DEFINITELY be the Number One Catcher in 2008. Considering that there is little catching talent within Our Organization--obviously--Jim Bowden has something else in mind from outside. And, even more interesting that Washington reportedly turned down Catcher Johnny Estrada from The Mets in this trade (yet, that's only speculation). Flores is quite the talent. He surprised many last season--enough to make Brian Schneider expendable. Yet, its odd to give up a solid receiver--when you are unsure of what remains on your squad at that position. Yeah, I understand the long term goals--but rarely does any team relinquish a solid talent--and just hope to fill that void. Really, that's strange--unless a countermove is coming soon. Another swap, which Bowden is not ruling out by his comments. And, I enjoyed Milledge's handling of the entire situation. He was impressive and was not shaken by either the trade--or the media. New York has provided some nice life experiences for him. A good thing. Afterwards--Sohna and I, met up with our good friends and fellow season ticket holders--Colleen and Jeff--at an Arlington, Virginia Italian Restaurant to celebrate both My Main Man!! Ryan Church's and Brian Schneider's efforts over the past three years of Washington Baseball. We are going to miss them. Its the least we could do for the fun they help provide all of us. It's the part of The Great Game, you come to dislike. The Trading of Your Favorite Players. Sometimes, following Our Washington Nationals can hit me hard. And, it has nothing to do with a frustrating loss. Whether or not My Main Man!! Ryan Church or Our Favorite Catcher--Brian Schneider--would EVER be All Star Players is not the point--the African Queen and I came to like both of them. We admired their professionalism on the field, as well as,the way they handled themselves off the baseball diamond. They are fun--enjoyable people. No, we did not know them that well at all. But, both Ryan Church and Brian Schneider were stand up folks. And, their spouses--Tina & Jordan always had something nice to say to us when we came across their path at RFK Stadium. The announcement this afternoon that both Church and Schneider have been traded to The New York Mets for Lastings Milledge--hurts us--right in gut. Yes, Major League Baseball is a business. And, Our Washington Nationals are building to win for the future. Lastings Milledge is a quality talent, although--like everyone out there--no one really knows yet whether this 23 Year Old will live up to his hype. But, right now--having just heard the word while editing our latest story this afternoon--all my work came to an abrupt end. I felt like I have just lost some of my best friends. Immediately--I called Sohna and she was stunned. And, could no longer concentrate on her tasks at hand. No, as much as we LOVE RYAN CHURCH--we were not surprised to see My Main Man!! traded. For some time--his future wearing a Washington Uniform was in doubt. Our Former Number 19 was a good player, with power. But, its become clear that Our Washington Nationals did not wish to continue with his services. And, despite other rumors--the fact that Brian Schneider was also included in this deal--was something not reckoned by us. No--we didn't expect Our Former Number 23 to hit the road--especially to play for The Mets. Yeah--Brian regressed at the plate last season, but he is a very good catcher. Many have said, its better to trade ANY player one year too soon, than one year too late. Hopefully, Our General Manager Jim Bowden knows what he's up to for this trade. 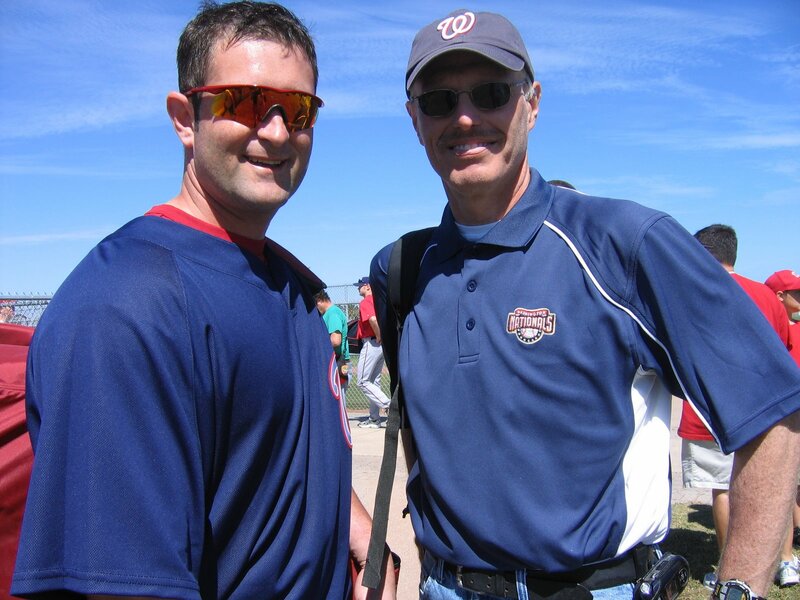 From the very first days of Our Washington Nationals--Ryan Church and Brian Schneider stood out for us over most every other player that transferred with Our Team from Montreal. Today--as Our Washington Nationals look to an even younger and brighter future--Sohna and I reflect back on all the enjoyment both these fine young men gave us as members of Our Washington Nationals these past three seasons. My Main Man!! Ryan Church and "The Captain" (to me) Brian Schneider--Good Luck to both of you. May your Major League Careers be long and rewarding--no matter where you play. And, to Tina, Jordan and Baby Tatum--Sohna and I thank you also--for letting us into a very small part of your hearts. We shall miss you at the new ballpark on South Capitol Street. Yet, none of you--will be forgotten for Your Efforts on East Capitol Street since 2005. Written from Our Now Broken Hearts. More later--after Sohna and I have a chance to better reflect and look at the complete picture. You have to wonder whether this is a set up for something greater come next week in Nashville, Tennessee--at The Winter Meetings. Busy Schedules and Conflicts has made an expected meeting with Centerplate to be moved back to a later date. Some important parties to the original chat--could not attend the conference. At the same time, for the past six weeks, I have been flying around the country working on a five part series for my television network. My editing of these pieces--as well as--The Annapolis Middle East Peace Conference being held in our backyard this past Tuesday and Wednesday--has made my spare time--SCARCE--to say the least. But, that does not mean--folks are not listening and paying attention to your earlier thoughts. As promised--Centerplate has received each and every comment left from readers the past week concerning food and concession desires at New Nationals Park on The Nats320 Blog. And, they were encouraged. As Bob Pascal, Vice President of Marketing, told me this afternoon: "As we discussed before--when you come to a ballpark--its not just always about the baseball game. For us, its all about The Experience. We have alot of exciting things in store. And, we can't wait to share them." Very soon, everyone involved is hoping to reschedule this meeting. When that event does occurs--you can bet--all the pertinent information, provided will be passed along. Your Guess--Is As Good As Mine--As To What Will Happen. Beginning next week when The Major League Baseball Winter Meetings commence (in of all places--Nashville, Tennessee?). Our Washington Nationals have control. No, they DO NOT have to make any move. But, undoubtedly--Our Team Most Likely Will. You just know, as well as I--Jimbo's itching for a deal. Making THE BIG SPLASH--is just his way. Expectations which many of Our Fans also look toward. Which means to me, If My Man Man!! Ryan Church; "The Most Thrilling Closer In The Game"--Chad Cordero; or "Big" Jon Rauch are on the trading block, as reported--Our General Manager better get something good--in return. Jim Bowden though has NO PRESSURE to make a move--now. None whatsoever. Our Washington Nationals are Team Building, not necessarily looking to Win The World Series in 2008. Looking to improve, is all Bowden really has to do. He should be a GM waiting to pounce. Jumping--on a "You Got To Be Kidding Me OFFER" from another ballclub that is DESPERATE TO WIN NOW. Foolhardiness, that occurs every single off season The Great Game has ever existed. Some Major League Clubs are not necessarily sharp--when a Championship is close at hand. Over the past three seasons as the Original General Manager of Our Washington Nationals--Jim Bowden has been nothing short of creative. You have to give him credit for that. Yeah, you can criticize his signing of Cristian Guzman to a four year contract. Maybe nitpick a few other signings (the atrocious Damian Jackson comes to my mind). But, under the circumstances and restrictions of Major League Baseball--Jimbo did well. With no money under MLB's Charming Ownership--DC's new found team competed. And, at least during 2006--provided Washington's Faithful with one of Baseball's Most Exciting Players--Alfonso Soriano. With Major League Baseball in control--fielding a respectable team was the only goal. A desire which has changed drastically since The Lerners took over control of Our Team. Our Washington Nationals assuredly want to Win. Not just now--but for years to come. MLB is NOT the NFL. Nor is it the NBA either. In those professional leagues--most teams load up for the short term. Thanks to a need to get under a Hard Salary Cap, which results in rampant Free Agency. Major League Baseball only has a Luxury Tax for Big Spenders. The New York Yankees and The Boston Red Sox are not deterred by having to pay other baseball teams--their competition--their hard earned money. Except for The New England Patriots in Football and The San Antonio Spurs in Basketball--every other team in those other professional leagues--has never been able to figure out how to work out Wages and Winning--consistently. Ask The Washington Redskins--perennial Off Season Champions In Salary Signings--but, regular season disappointments. The Point is that Our Washington Nationals are in the drivers seat come next week. Waiting for a GOOD OFFER is Paramount. Yes, they have some talented young players that other teams may want--Ryan Zimmerman, Church, Cordero, Rauch, Jesus Flores and Wily Mo Pena--all come to mind. But that doesn't mean you give that talent away--just to make a move (and just to be clear--I am not naming "Z" as trade bait. Our Number 11 is mentioned to bring forward what a FRANCHISE PLAYER he will become--in Washington). Along with a strong 2007 Entry Draft of Young Players--DC's Team has made great strides over the past 18 months. Piece by piece, Washington is becoming competitive--for the long haul--not to become a lucky fly by night--winner. The Baseball Brain Trust of Our Team has proven formidable. So, if Jim Bowden does end up swapping any three of those aforementioned trade bait players--Our Washington Nationals better get a TOP FLIGHT STARTER for their rotation--in return. Nothing else will do--for me. As Bowden always states--Baseball is all about "Pitching, Pitching and More Pitching." You can't win without top hurlers. Remember, a Championship--is not a Realistic Expectation for The Inaugural Season of New Nationals Park. But, continuing to build a Quality Franchise for the future--piece by piece--is not only reasonable--but expected. No, I don't know what Jimbo has up his sleeve, next week. Although--I have no doubt--Our General Manager is looking to make The 2007 Major League Baseball Winter Meetings Very, VERY Interesting. What will Santa Claus bring Our Washington Nationals come Christmas Day? Yes, remembered fondly are those Helmet Sundaes of my youth. And, apparently, just as beloved by many other Fans--both young and old--of Our Washington Nationals today--even though they were never SOLD at RFK Stadium. During the late 60's at The Old Ballyard--you couldn't get one--as far as my memory can be jogged. But, I remember vividly, High's Ice Cream Stores (Now that's a Brand Name only the above 40 Year Old Set will probably recall) offered a Washington Senators Ice Cream Batting Helmet in 1971 (High's preceded Baskin Robbins and 7-11 Stores until both of those franchises entered the DC Market for good--putting High's out of business. 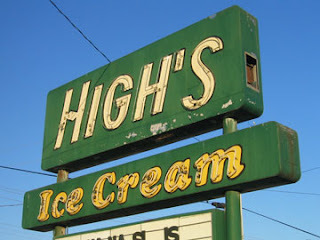 High's Ice Cream was CHERISHED during my youth). Fortunately, my brother Michael and I grew up in Alexandria, Virginia with a High's a short 10 minute walk from The Home of Our Youth. You can bet we picked up a couple of them. And, yes, I still have some today. Unfortunately, The African Queen and I can't seem to find the exact box that contains them. Only over the past few years, has Sohna realized The IMPORTANCE of those Washington Senators Mementos she so carefully stored away. (Sigh) Oh Well, one day--we shall come across them unsuspectingly. Thankfully, she's made a point of digging them out. Gotta LOVE!! The African Queen!! Of course--Batting Helmets were a Novelty for Major League Baseball in the Hippie Era--Vietnam Era, of United States History, as well. Batting Helmets only became mandatory protection for hitters in the early 1970's. Full Fledged Batting Helmets with the Lone Ear Flap did not come into its own until 1975. In fact, when I began playing Little League Baseball in 1968, the only protection provided for the head was a modified two piece ear flap from a FOOTBALL HELMET with elastic bands that stretched around our little heads. No protection for the top of your noggin. 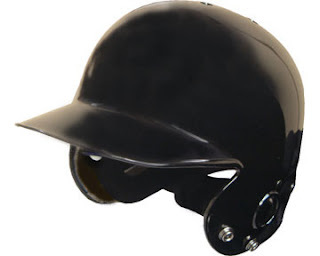 Obviously--that wasn't enough protection--as by the time I reached the age of twelve--a full helmet with dual ear flaps was standard for Little League and High School Baseball. Good thing it was--as when I began playing High School Baseball at T.C. Williams in Alexandria--one night I was absolutely NAILED by a 99 MPH Fastball off the arm of this young stud from W.T. Woodson High in Fairfax. For the life of me, I can't remember the young pitcher's name--but he was drafted and toiled in the Minor Leagues for a few seasons. That Boy THREW HARD!! 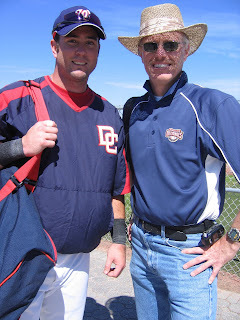 His pitch was so ON TARGET to my head that night--it DRILLED a hole right into my Helmet KNOCKING ME OUT COLD. Brother Michael--still to this day--recalls how surreal the moment was. Old Number 17 (Michael) says there was not a sound heard ANYWHERE after I went down at Eugene Simpson Field in Alexandria (Our Home Field--T.C. has never played ON CAMPUS--even to this day). The Alexandria Paramedic (On Duty at the game) revived me after a few minutes and laughed--when after asking me if I knew exactly where I was-- I proclaimed: "Yeah, China--The World seems totally upside down right now." And, yeah--that helmet with the hole in it, I kept it too. But, its also buried away somewhere with those plastic Helmet Sundae Cups. 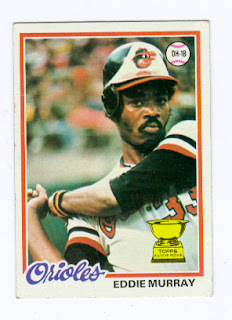 Including, an old fashion Baltimore Orioles Helmet Sundae. Black with White Triangle across the front with The Oriole Fun Bird from my Memorial Stadium Days. Those Helmet Sundaes were cool. And, like everyone else it seems, Sohna and I would LOVE to see the return of Curly "W" Helmet Sundaes to New Nationals Park. Honestly, there is just something SPECIAL about Helmet Sundaes. 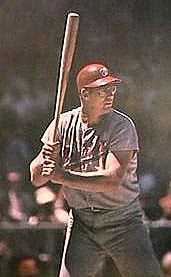 Although Our Washington Nationals never sold Helmet Sundaes at RFK, one time--in the first three seasons of baseball at RFK STADIUM, Red Curly "W" Helmet Sundaes Were Served. Only Once. 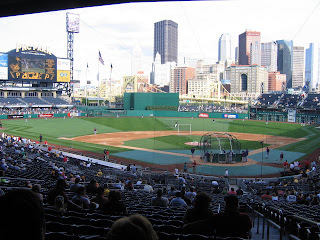 On June 11, 2006--Major League Baseball--having just concluded the sale of Our Team to The Lerners-- MLB held an ON FIELD Picnic after a Sunday Afternoon Game with The Philadelphia Phillies. This Picnic--for Season Ticket Holders--included a nice gift bag of Plush Nationals Blanket, Tan Curly "W" Cap and assorted goodies. But, on the field that afternoon--ICE CREAM was served in a Plastic Helmet. A Plastic Red Curly "W" Helmet. The African Queen and I picked up a few. One of those Helmet Sundaes is depicted at the beginning of this post. Another shot--below. Yes, We Cherish Them. Hopefully--many more fans--Young & Old--will be able to share that same experience come 2008 at New Nationals Park. Helmet Sundaes need to became a staple for Our Washington Nationals. No Question About It. Sohna and I hope that all of you had a Very Happy Thanksgiving with your Families. And, that all that gobbled down food was good and enjoyable. There is nothing like eating a well cooked meal. Nothing like savoring a Home Cooked Meal with friends and family. Which brings me to the topic of today's post--Food. For some time now--Centerplate, the new concessionaire at New Nationals Park kindly has kept me informed about their progress on South Capitol Street. In fact, we have a scheduled meeting this coming week to discuss the latest update. But, before we meet, I am interested in hearing more from you. Some updated thoughts concerning fans wants and desires at New Nationals Park--when it comes to concessions. Like before--when this question was asked--all those original responses were forwarded to Centerplate. And, as promised--they seriously looked into each and every one's desires. This week, I am expecting to hear their feedback from those comments. Interestingly, in that first post, Five Guys Burgers was prominently mentioned. 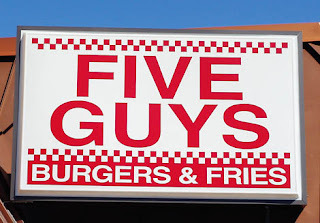 Now, this is slightly off topic and has nothing to do with Centerplate--but when Sohna and I visited the new ballpark for the Grass Unveiling Press Conference--we both noticed a Brand New "Five Guys" Burger Restaurant on 2nd Street, SE. This particular chain is located directly across the street from the East Entrance/Exit to The Navy Yard Metro--on the other side of the building which houses a CVS Pharmacy on New Jersey Avenue, SE. Five Guys total distance from New Nationals Park--One Block--less than a five minute walk. There are many issues on the table with Centerplate. Some of which will center around whether fans want more than just Hot Dogs, Hamburgers and a Cold Beer. So, are you interested, at times--in something a little different? Are you willing to fancy something not usually on a ballpark menu? Would you be interested in healthy fair? What would you like YOUR KIDS to have available to them--other than the usual Cotton Candy and Ice Cream? Would you have time, occasionally, to actually sit down and enjoy a Pre-Game Meal? That last question--asked outside of Diamond Club and Presidents Club Seating and those patrons? In my short time dealing with Centerplate--they have been nothing short of actively involved in finding the best mix for, not only their business, but Our Washington Nationals business, and their Fans wishes, as well. Granted, they do have a very tight turnaround time to get New Nationals Park up and running come March 29, 2008. And, not every one's whats and desires will be included on the ballpark menu. Nor, is it likely that everything Centerplate wishes to implement on South Capitol Street will be 100% ready come that first GameDay. But, that doesn't mean Good Changes for EVERYONE are not on the way. If you have time--please leave your comments here and they will be forwarded to Centerplate, again. 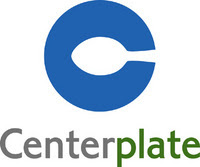 Seemingly, Centerplate understands--we are all in this together. Hopefully, in the long run--a better ballpark experience can be had by EVERY SINGLE FAN. This afternoon I touched base with Tony Gittens--The Executive Director of The DC Commission on The Arts and Humanities. He was very happy to report that a 4th Piece of Artwork has been approved for New Nationals Park. 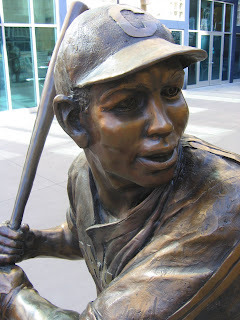 Unlike the Walter Johnson, Josh Gibson and Frank Howard Statues that have previously been announced--this additional piece, by Artist Walter Kravitz (Professor of Painting & Drawing at George Mason University), will be a Hanging (Suspended) Mobile. Site on South Capitol Street--to be determined. The Kravitz Artwork will be a Generic Piece of about Baseball. The Individual Ballplayers to be depicted will not be wearing any specific Team's Uniform. "I am very happy that this piece was approved last Thursday." Mr. Gittens said. "Since the three statues will be placed in the Main Entry Plaza (between the two parking garages in left center), we really wanted to have something different elsewhere that represents the game itself--not individuals." No Artist Renditions of any of the upcoming work has been released, yet. "Soon", Mr. Gittens promised. At the same time--the work now begins with The Commission, The Artists and The Family Members to find a working sculpture for the three Former Washington Greats that everyone will be pleased with. And, to be clear--none of these new artworks will be ready for display until well after the 2008 Season Begins. "I don't want to get locked into any time frame. Although, I am positive nothing will be ready for Opening Day, or anytime soon after that. We also must work with The Nationals, their Game Schedule and other factors, when it comes to the final installation of each piece." In few weeks time--Mr. Gittens said we will talk again on a further update. Personally, I can't wait to see the working pictures of the final products. When Sohna and I visited PNC Park last Summer--The Statues helped to make The Pittsburgh Pirates Home Field that much more special. Those Statues--along with that TERRIFIC SKYLINE VIEW. What A Park--PNC Truly Is! Hopefully, New Nationals Park will be as SPECIAL!! Disheartened Sohna and I were to read and hear that some Season Ticket Holders of Our Washington Nationals did not get any of their expected choices during the recently completed Relocation Process. Hopefully, The Team will take care of those Ticket Holders who feel they should have received better seats. We only wish those folks the best. Never, do you want to move from an older stadium to a new one--feeling left out. Especially, after supporting Our Team for over three seasons. Having said that, NEVER could this process be perfect. That's an absolute impossibility. There is No Way Our Washington Nationals could have satisfied every single person 100%. Just not going to happen--over anything so complex--granting new seats at New Nationals Park. No, its not as easy as many have stated. Yet, for the most part, from what I had read and heard over the past 24 hours--far more seem happy than sad over their given seat assignments. And before anyone starts hammering away on me and Section 320--many of US did not get everything we wanted, also. We were in the same boat as you. In fact, a complete Makeover of The Former Section 320 is officially in the works. Drastic Changes are in store. Yes, The Section 320 from The Old Ballyard on East Capitol Street, The African Queen and I came to love, will no longer exist on South Capitol Street. A Breakup based on many factors. Most of which really could not be avoided. Its the nature of the beast when wants and desires change. New Nationals Park is a completely different venue from RFK. The New Stadium is geared to make money on its most desirable seats. Expectantly--seat prices went up. That Rising Cost Factor a key decision maker for some--and understandably so. Others were concerned about sitting in the Sun. One of the very best enjoyments from sitting in Section 320--was NEVER being affected by Rain, Sun, Sleet or Snow. Always, we were protected thanks to the Mezzanine Overhang above. Any Overhang at New Nationals Park mostly does not exist. Much of the park will sit in the sun during Day Games. Anyone that has roasted at RFK during any summer baseball game--will understand that worry. Its a big one, especially for those who have enjoyed the comfort of shade protection since 2005. Also--some wanted to move behind Our Washington Nationals New First Base Dugout at New Nationals Park. In particular, Sohna and I did not wish to remain behind The Visiting Dugout and listen to the many StubHub and Ebay Buyers and Fans from The Visiting Teams. Those Away Team Fans that consistently sat behind The Top Drawing Teams at RFK Stadium's First Base Dugout. No, for us--and other friends as well--the less Tomahawk Chop, Phillie and Mets Fans as possible--the better. At the same time--all of us had completely different Priority Status, affecting the final outcome greatly. Would we all have LOVED to stay together in our same configuration enjoyed over the past three years? Yeah, you better believe it--that I have no doubt. And to their great credit--Our Washington Nationals were willing an attempt, to move all of us, as ONE GROUP, to a set part of New Nationals Park. Together, I am certain we could have remained a group. But, it was also made clear that ALL OF US would have to settle for less, in seating, to satisfy everyone. Priority Status was a Major Factor, but so was price point. In the end--some of us attempted to stay together, but it simply didn't work out. No one is to blame. Neither Our Washington Nationals, nor any of Our Friends. We shall miss them greatly--but that also doesn't mean we can't still enjoy each others company during baseball games on South Capitol Street. Spread Out we are--but some not so far away to be anything but distant cousins. Sohna and I were placed in Club Level, Section 218. Others were placed in Sections 207, 210 & 220. All those friends also in nearby Club Level locations--just not within shouting distance. A few have been placed in Section 113 down the left field line. Even some more--down the right field line in Sections 223 & 225. A couple of folks we have yet to hear from. One of Our Good Friend's Ticket Group--that sat to our right at RFK had a breakup. A few of those folks are looking to join with others right now. The Baseball Games will go on. So will Our Friendships. The Fact that we shall no longer be completely together will not spoil our fun. When Sohna and I first sat in Our Seats in Section 320 for the very first time in March, 2005--We didn't know ANYONE. Come March 2008--The African Queen and I may well recognize some familiar faces--but we are confident new friendships are on the horizon. And, just as much entertainment as well. 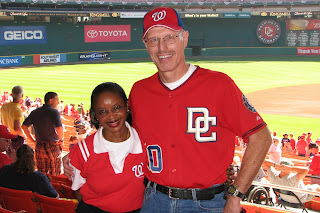 Unquestionably, we shall come across even more Baseball Fans of Our Washington Nationals that enjoy the fun we always relished in Section 320 at RFK Stadium. That, I have no doubt. Now, Section 218 is Our New Location--but the The Nats320 Blog WILL NOT change its name. Sohna and I experienced SO MUCH Happiness, Amusement, Thrills and Satisfaction among Our Dear Friends there--we don't ever want to forgot those last three FABULOUS YEARS on East Capitol Street. Really, they were WONDERFUL!! The only questions now are whether MY BEST FRIEND SCREECH!! will be able to fly up to see us? And, what are we going to do about the "Let Teddy Win!! Chant. I am sure Teddy will be able to hear us from Club Level--down on the field--lets just see if he can climb that railing in front of us in New Section 218 for one of his Virtuoso Performances. Now, That WOULD BE IMPRESSIVE!! Good Luck to EVERYONE looking to get their seat assignments changed. For the baseball games to be fun--you got to enjoy the seat you are sitting in. Sohna and I look forward to seeing ALL OF YOU at New Nationals Park in 2008. PS--Yes, The African Queen and I will miss Our Friends from Section 320. But, at the same time--we are very happy with our relocated seats at New Nationals Park. As some have now emailed me to mention New Seat Relocations are now up for all Season Ticket Holders at nationals.com--I was curious to find out what everyone else received? Sohna and I are waiting to hear from all our Section 320 Friends before letting everyone else know. We are dying to find out about our companions over the past three years. Were you happy? Sad? or Indifferent? Did you think the process played out fairly? Or not? I really want to know how folks feel. It's Important. Everyone had to see this coming. And no, I am not surprised--but it still hurts. Big Time. Today's Indictment of Barry Bonds on Perjury and Obstruction of Justice Charges--Officially Marks much of the past decade of Professional Baseball--AS A JOKE. This is not a pretty sight. Sure, its been rumored for some time, and written about in the terrific book--Game of Shadows. But now--The Current All Time Home Run King is, Officially, alleged to have lied about taking Steroids. Legal proceedings are beginning against him. Like those players exposed already and certainly more to come in the future--without any more doubt--Baseball OFFICIALLY turned its back on a serious problem in the mid-90's--in order to regain market share after a DEVASTATING STRIKE in 1994. And, to Rake in The Big Bucks. The Players are not all to blame here. For Glory, Fame & Riches--Baseball Fans were duped. Now--Major League Baseball looks foolish. And, we all must suffer. Players Cheated--The Baseball Establishment allowed it to happen. As of today--November 15, 2007--Major League Baseball is a FAR lesser game. No American Sport so rich in History. No American Sport so tied to its very own Statistics. No American Sport now so saddled with its Record Book in Disarray. Never again can ANY TEAM from past or future decades of Major League Baseball be compared to teams from the last 10 Years. That's a shame. Never again can Baseball Fans enjoy conversation over who was The Better Hitter? Who was The Better Team? Or, Who was The Better Player?--when it comes to baseball's performers over the past ten years. For Years and Decades to come--the arguments will rage. Do you erase records and statistics by those that were caught? Or, do you allow those tainted marks to stand? There is no real answer. Because--if you expunge any record, by any individual who may have cheated--you must wipe out EACH AND EVERY GAME PLAYED over a certain period of time. Baseball is too intertwined. Any outcome on the field--is affected by more than just one dirty player. That's the truth. Never, could anyone come to a reasonable conclusion on this fact. Unless Major League Baseball wipes out most of the past decade of Major League Seasons--EVERY SINGLE RECORD--even those of Barry Bonds--will have to stand. Fans will have to live with these falsehoods--whether they like it or not--which I certainly don't. The Dishonesty over most of the past ten years--tears into the very fabric of the game itself. Yes--An Asterisk should be placed next to Bonds' records--whether he's convicted, or not. But, Major League Baseball needs to place an asterisk, as well, over each and every one of its own Championship Seasons since the mid to late 1990's. Nothing short of that--will really be telling the truth!! What A Shameful Day for Major League Baseball. Their House--So Out Of Order--to allow this to FESTER. Commissioner Selig--this happened on Your Watch!! And, you only seemed to care--when The Federal Government threatened your owners. What a farce. Like most everyone--my head has not been in the sand on The Issue of Steroids. No, I have not been in denial. The Tragedy of its rampant use in the game I love, has bothered me for some time. And Now--the Most Treasured Of Baseball Records of My Favorite Sport--will NEVER BE THE SAME. Sorrowful--is the only way to describe my feelings this evening. 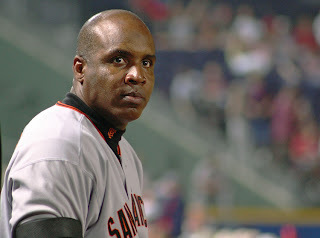 Yet, The Indictment of Barry Bonds does allow for one Major Step to Begin--Finally--after so much pain. The Healing of The Great Game. After all the dignitaries stated their praise concerning the Construction Process of New Nationals Park, Team President Stan Kasten met with the assembled media behind home plate--in The Diamond Club Seating Section to take questions about The Seat Relocation Process, Ticket Sales and The New Ballpark. Here is that Press Availability, word for word--in its entirety--as Mr. Kasten discussed Seat Relocation and Ticket Sales. Mr. Kasten's comments are always in quotes. Reporter Questions Clearly Marked and Not In Quotes. Here we go. “No. But, we DO HAVE TICKETS AVAILABLE TO THEM TO BECOME NATS SEASON TICKET HOLDERS!! (Everyone Laughing—you could tell Mr. Kasten was pleased with that comment). AT ATTRACTIVE RATES!!" “Soon, is what I have been told. That concludes this portion of Stan Kasten's Media Availability from this morning at New Nationals Park. As always--the goal is to get out as much information as possible--so everyone can make their very own opinions--without the editorial slant of any other reporter. 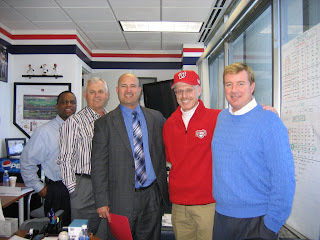 Hopefully, you find Mr. Kasten's comments helpful to your Game Ticket Situation with Our Washington Nationals. Once again, it was raining--hard. But, we were not deterred. Sohna and I headed out, yet again, to New Nationals Park for this morning's Press Conference signifying the completion of The Grass Playing Field on South Capitol Street. DC Mayor Adrian Fenty was there, along with Our Washington Nationals Team President Stan Kasten, as well as--all the top players from The DC Sports & Entertainment Commission--Matthew Cutts (Chairman), Greg O'Dell (CEO) and Bill Hall (Vice Chairman). Those moments given to view the field first hard, were nice--as well as another opportunity to view the Construction Progress of the new ballpark. Despite all that, the most important information we were seeking concerned Season Ticket Holders. When will everyone be notified on their relocation? When Payment will be due? How many Seats have been sold--and when will that Very First Game be played? Here's the Crib Notes Version--just the facts. I still need to transcribe the Stan Kasten availability to the Press, as well as, comments from the many dignitaries. At the end, Mr. Kasten was kind enough to personally show Sohna and I The Founders Club--behind the Home Plate Stands and its views overlooking the Nationals Indoor Batting Cage and Media Interview Room. Its Going to BE NICE!! This coming Friday--November 16th--all Season Ticket Holders from Classes of 2005, 2006 & 2007 will be sent, via First Class Mail (not overnight) their Seat Locations and Invoices. According to Mr. Kasten--as he personally told Sohna and I this as we walked from The Founders Club--there will be Two Payment Options. You can pay In FULL by December 14 or make a Half Payment. Those that pay in full, by that date--WILL RECEIVE--a special Ceramic Replica of New Nationals Park. Those who pay half down--will have one more month to pay off their invoices. All this information will be included in the packet sent to Season Ticket Holders on Friday. This Packet will also include a Tentative 2008 Schedule. There is still some uncertainty, though. Club Level is SOLD OUT. Most of the Higher Priced Presidents Club and Diamond Club Seats are mostly sold. Suites, according to Mr. Kasten--are selling well. The Lower Main Bowl is mostly sold to FULL SEASON TICKET HOLDERS--except for the corner sections down each base line. Partial Season Ticket Holders requesting Lower Bowl Seating--have been placed in Left Field. 50% of all Seat Requests by Fans during Relocation received their FIRST CHOICE. 90% Received one of their first THREE CHOICES. There wil be some sort of Get to Know Your Seat type events--but no dates yet--as The Ballpark is still VERY MUCH a Construction Site. Mr. Kasten told me this is something the Team Definitely wants to do, just not sure of the dates. Although, All Season Ticket Holders are invited to a Special Get to Know The Park Exhibition Game on March 29th--against The Baltimore Orioles. This GAME IS FREE for all Season Ticket Holders. No Individual Game Seats will be sold. The Remainder of Seats will be provided that day only--for Our Washington Nationals Programs for Youths in the City. Mr. Kasten is still hoping to play a March 30th Season Opener Night Game on ESPN. The Logistics have not worked out. There are still SOME Infield Gallery Full Season Tickets Available (not Terrace as I originally wrote--thinking too much of Our Former Section 320--thanks ABM). The Team officially states they are working off a Full Season Ticket Holder Equivalent of 15,000 Season Ticket Holders at the end of 2007. A few thousand more have signed up since. Those 2008 First Time Season Ticket Holders will be placed in their seating about 4 weeks from now. This would allow for any last minute jockeying by anyone that might not be happy from 2005, 2006 or 2007 Season Ticket Holder Classes wanting to change their location. Single Game Tickets for 2008 will go on sale in Mid-February. The Free Shuttle from RFK Stadium to New Nationals Park is still being discussed between The City and Our Washington Nationals. From the looks of those at this Press Conference upon answering this question--you have to figure its going to happen. No one seemed taken back by this problem. Those are the Basics. The African Queen and I took another ton of pictures covering the ballpark. Also, we had a nice chat with Jacqueline Dupree from JDland.com. She's like a celebrity. Everyone wanted to say hello to her. More coming later--as I transcribe the Stan Kasten Interview. If you have questions--please let me know. There might be some information that I can pass on that--doesn't come to mind right now.